Experience High Definition Boat Positioning. 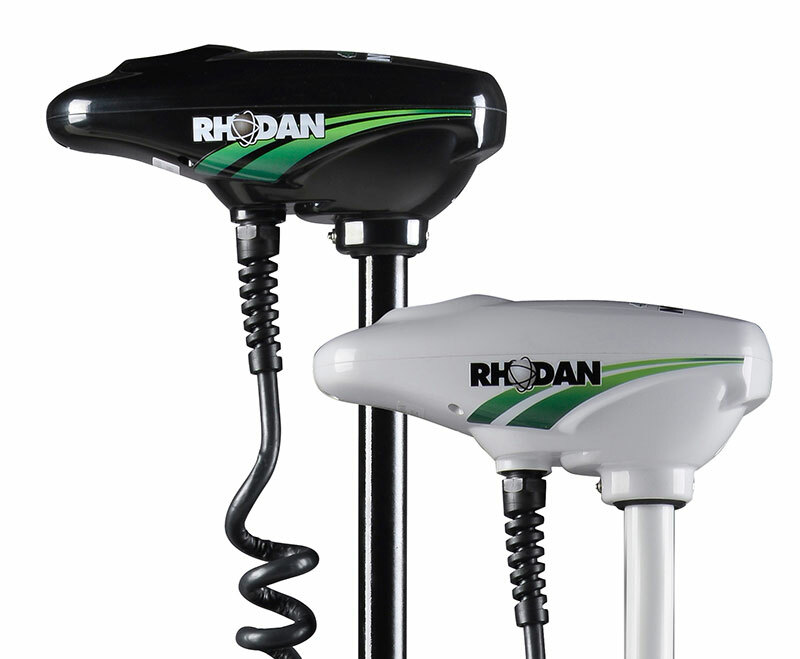 The Rhodan HD GPS Anchor ® is a virtual anchor, an auto pilot, and a wireless trolling motor all in one remarkable package! 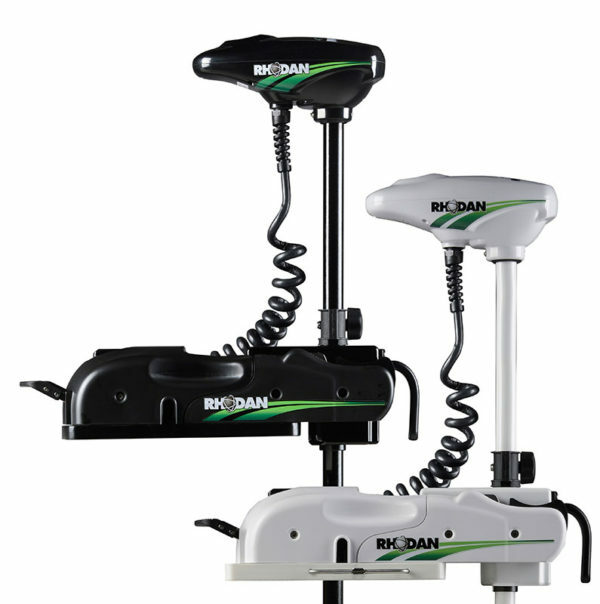 Each system includes a Wireless Fob with lanyard, a Quick Release bracket, a prop kit and Line-X® finish. GPS guided and wirelessly controlled, this unique Trolling Motor is designed to improve your fishing experience. This patented system has evolved to its present configuration over years of use by its inventor. When you find a spot where the fish are biting, touch the anchor button on the fob and the GPS Guided Trolling Motor will automatically keep the bow of the boat within a few feet of the spot while you concentrate on the fish. 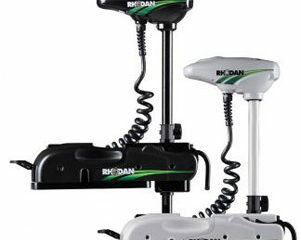 Rhodan Marine Systems has incorporated a remarkable micro-computer module that utilizes a high definition GPS receiver to monitor and control the trolling motor. Our quiet and powerful thruster delivers 80 pounds thrust by industry standards. 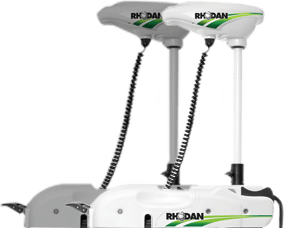 Each system includes a wireless fob, a quick release mount, and an efficient 3-bladed propeller! To view Specifications, see owner’s manual. In Anchor Mode®, the HD GPS Anchor ® Trolling Motor will keep the boat’s bow parked where you want it, in any depth of water, automatically compensating for wind, waves and cross-current. Anchor Sites can be jogged in precise 5 foot increments in four directions relative to the boat’s heading using the wireless fob. No need to mess with a wet and tangled anchor line. High definition precision differential GPS receiver provides remarkable positioning accuracy. In the Track Mode, the HD GPS Anchor ® Trolling Motor will automatically pull the boat along a chosen course, continually compensating for wind and current disturbances. Dual Tilt-compensated compasses keep your boat on a stable directed path as your boat makes a beeline track at your chosen target. This allows you to fish your favorite shoreline without continually correcting your boat’s heading. The track speed is adjustable (10 thrust settings) and the track heading can be changed in precise 5 degree increments, all using the wireless fob. In the Manual Mode, the system behaves just like a normal trolling motor, allowing the operator to wirelessly steer the system and control the thrust. Rhodan has refined the system further by incorporating Thrust Dependent Electronic Steering Control, complete forward and reverse thrust capabilities, and anti-wrapup technology which prevents the power cord from winding itself around the shaft. The HD GPS Anchor ® Trolling Motor has 12 memory locations. Four of these are dedicated to memorizing anchor sites. The remaining eight can be used to record intricate paths or routes over 1000 miles long! 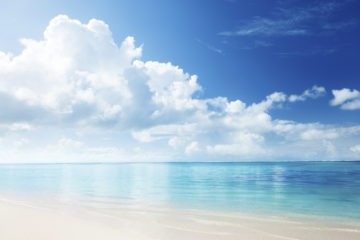 The twelve memories will remain in the system memory even after power down. Paths can be recorded while running at trolling speed and even at cruising speed with the trolling motor stowed! Play your recorded routes back at your chosen speed while the precision HD GPS Anchor ® steers your system for you! 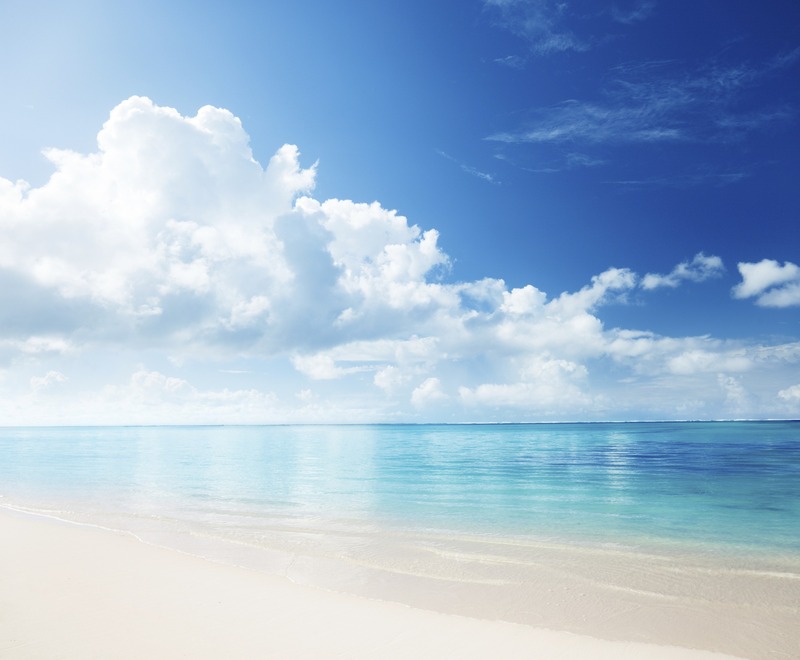 The system will automatically anchor the boat when it completes a memorized route. See the owner’s manual for more information. State-of-the-art Digital pulse width modulation (PWM) circuitry maximizes efficiency, minimizes heat dissipation, optimizes power and extends battery life. Stay fishing for hours longer on a single charge. Wireless remote control fob lets you control the Trolling Motor while fishing from anywhere on the boat. The fob is waterproof and floats. The HD GPS Anchor ® Trolling Motor can steer the boat while the main engine is at low power settings. This allows the system to troll at higher speeds or to anchor in fast moving current. Instant “Off” button in case you need it while working a fish. Audible battery meter allows the battery state of charge to be checked from anywhere on the boat using the wireless fob. 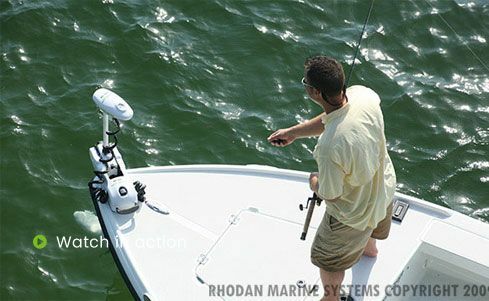 Stowed position sensor automatically prevents the trolling motor and propeller from operating in the stowed position. Lockable quick-release mount permits unit to be moved for safe-keeping or use on another boat. Durable corrosion-free composite shaft flexes upon impact. 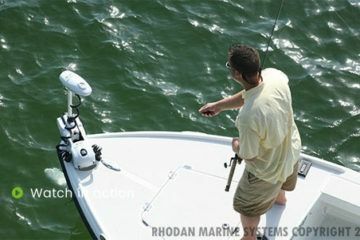 Rhodan Trolling Motors have been subjected to thousands of hours of durability testing and actual fishing use. 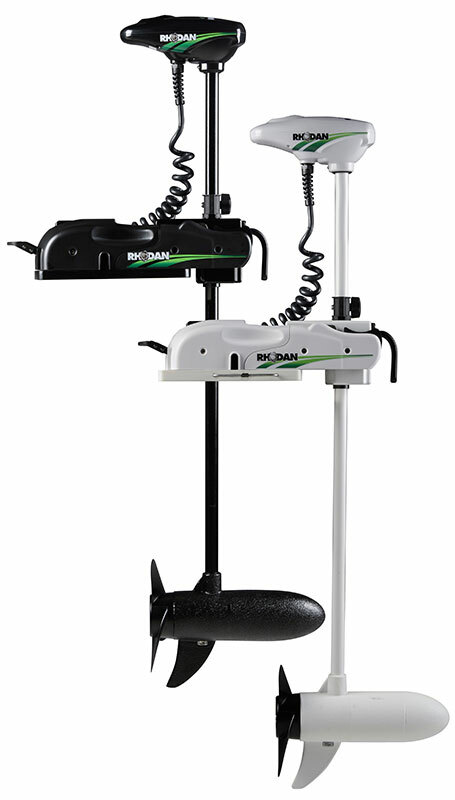 Both Black and White models are designed for saltwater use and are equipped with sacrificial zinc anodes and the trolling motor lower unit and shafts all include Line-X® finish. Click on the Owner’s Manual button below for complete detailed instructions.